Story: Prepare to meet your darkest fears in the conclusion of this gothic-noir adventure trilogy. 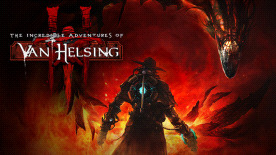 This is the finale, the darkest chapter of the adventures of Van Helsing. Classes: Choose from six playable classes: defeat your foes as the melee-specialist Protector, be the most accurate shooter as the Bounty Hunter, master the weird science as the Phlogistoneer, engineer your tactics as the Constructor, control the magical forces as the Elementalist or become a dark, stealthy killer as the Umbralist. Leveling: Become more powerful as you advance through the game: the level-up customization is more detailed and diverse than ever. Exploration: Explore new areas in this war-torn land of darkness - both in the physical world and the Ink. Camaraderie: Engage in witty banter with your loyal follower, Katarina - and finally, find out her secrets: the story of her past. Combat: Fight hordes of bloodthirsty enemies, now more feral and terrifying than ever. Take all the weapons and tools you need: choose from plenty of new powerful items for this adventure. Multiplayer: You and your friends can test your skills against each other via the PVP mode (8 players) or join forces and complete the story in the co-operative campaign (4 players).